In September of 2012 Fortis took on yet another challenging mine project. This particular job was at the Mosaic Colonsay Mine. 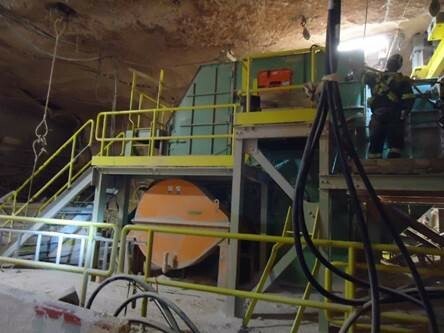 The scope of work included: demolition and removal of the existing conveyor; mucking, excavation, rehabilitation and rock bolting; installation of structural steel, mechanical equipment and all conveyor components. Fortis successfully completed the project two days prior to its scheduled completion date with no safety incidents. Fortis is proud of the quality of work it provided and its timely completion. Fortis Mining Engineering and Manufacturing continues to set the bar high as a Mining contractor and service company. Fortis continues it's work in many of the mines in and around Saskatchewan. Fortis has completed contractor work in Saskatchewan mines; PCS Allan, Mosaic Colonsay, SanGold Bisset, Cameco Cigar Lake, BHP Billiton Janzen, PCS Lanigan and many more.